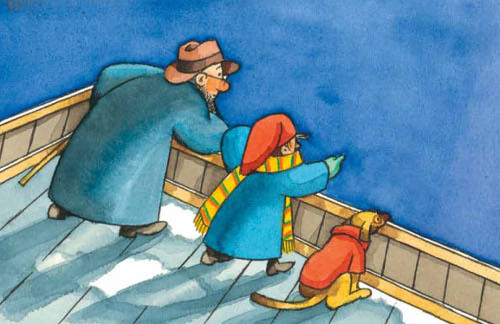 Author/illustrator Lori Nichols isn’t new to 7-Imp (she visited back in 2010), but at this 2013 visit she’s well on her way with an agent and a picture book scheduled to be released in February of next year by Nancy Paulsen Books. I’ve seen this book, called Maple, which Kirkus has already given a starred review. 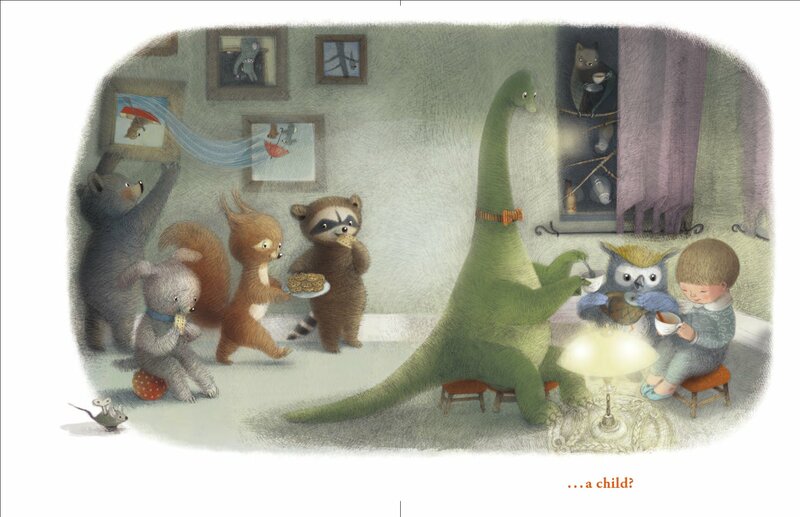 It’s charming, just like Kirkus says, and I hope to cover it here soon at 7-Imp when it hits bookshelves. So, more on that later (but the cover is pictured below). Today, I’m sharing images which Lori created last Fall and which I really like. Lori is working on some ideas for Nancy Paulsen using some of these characters, but I secured her permission to share a small handful of them today. Yesterday at Kirkus, I chatted with author April Pulley Sayre about her newest picture book, Eat Like a Bear (Henry Holt, October 2013), illustrated by Steve Jenkins. It’s so good, this book. April talks about the writing of it (“Language to me is visceral,” she says), as well as what it was like to see Steve’s artwork for the book. That Q&A is here, and next week I’ll have some follow-up images from Steve. Today, since I knew Kirkus deadlines wouldn’t stop for the holidays, I thought about what would be a good book to feature during the week of Christmas. 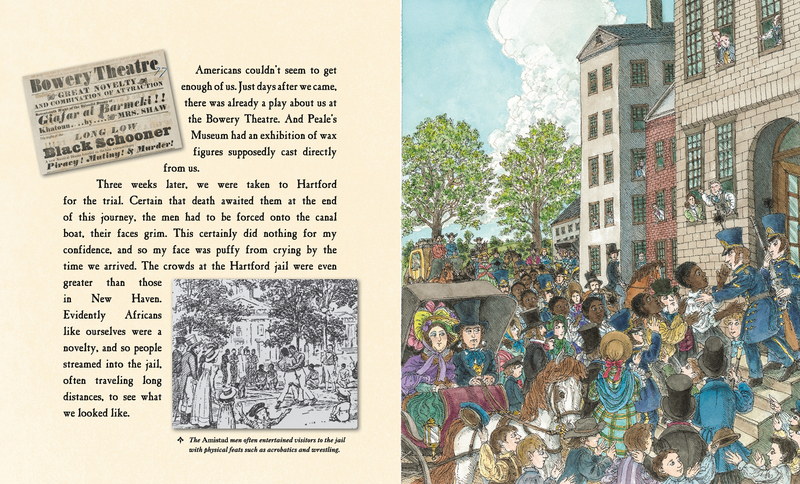 And Katherine Paterson’s Giving Thanks: Poems, Prayers, and Praise Songs of Thanksgiving (Chronicle Books, October 2013) came to mind immediately. My thoughts on that book are here this morning. Last week, I wrote here about some 2013 titles that got away from me, and today I follow up with some art from each book. “The crowds at the Hartford jail were even greater than those in New Haven. Just the other day at Kirkus, I wrote about some 2013 Picture Books That Got Away — that is, those books that during the year I had planned to write about here at 7-Imp or over at Kirkus, yet for one reason or another I didn’t get to them. One book I wanted to include in that list, yet I knew I’d be writing about it today, is Monica Edinger’s Africa Is My Home: A Child of the Amistad (Candlewick, October 2013), illustrated by Robert Byrd. This is a lengthier picture book, geared (if you heed such labels) at slightly older readers. (“10 to 14 years old” is how the publisher thinks of it.) This is the fictionalized story of the real-life child named Margru, who later became known as Sarah Kinson, taken from her home by slave traders in Mendeland, West Africa, “one of the greenest places on earth,” in 1839. At the age of nine, Margru’s father decided she would go as a pawn to work for the family of a man in her village. This would occur in exchange for rice, given that the village in which Margru and her family lived was suffering greatly from drought and famine. “At the next harvest,” her father told her, “I will return what I owe and you will come home.” Margru did as she was told, only to find soon after that she was “in a line of captives headed for the coast.” Slave traders transported Margru and many other West Africans, including three other children, to Cuba and later to the U.S. on the Spanish slave ship called the Amistad. Renata: “When I was little, I used to enjoy looking up at the ceiling and imagine living up there. We had a small apartment and it was full with us and our stuff. This morning over at Kirkus, I write about some 2013 books that got away. That link is here. 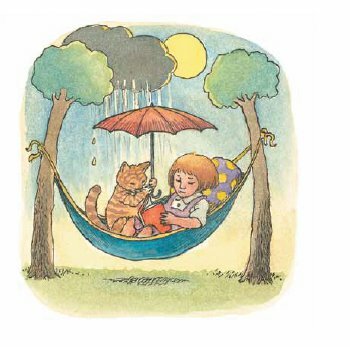 Last week, I wrote about Once Upon a Memory, written by Nina Laden (who chatted with me a bit about writing the book) and illustrated by Renata Liwska. That link is here. 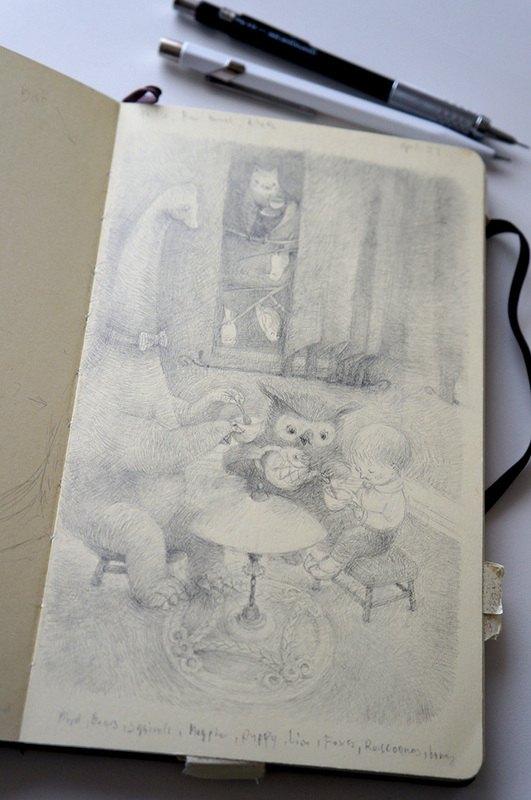 Today, I’m following up with some sketches and final art from Renata. 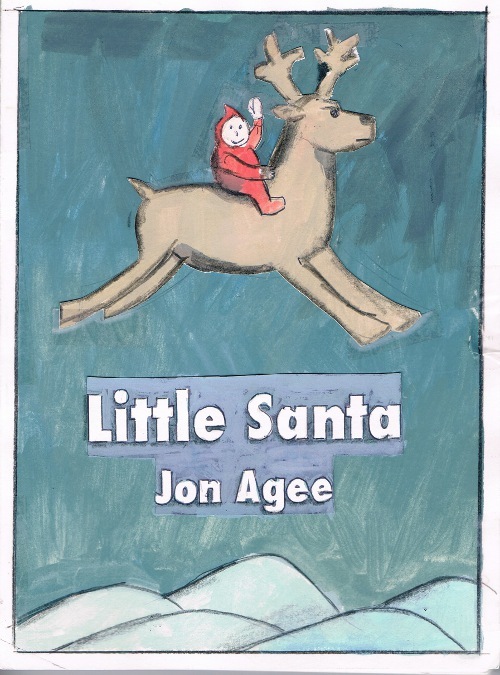 Last week at Kirkus, I chatted here with author-illustrator Jon Agee about a few things, including his newest picture book, Little Santa (Dial, October 2013). Today, I’m following up with some art from the book, as well as some dummy images Jon sent along (which he explains in the Q&A, but I’ll be sure to put captions below each of those images). 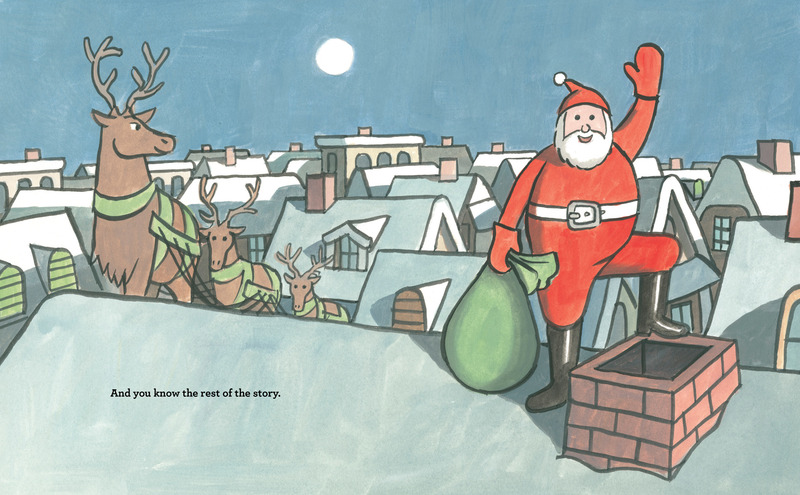 Jon also talked in one response about picture book publishing in the early ’80s “when publishing was a quieter, slower, leaner business, and the editorial staff still held reign over sales and marketing. I was a complete unknown, and yet I could meet face-to-face with editors, like Frances Foster and Margaret McElderry. Or receive inspiring rejection letters from Walter Lorraine and Gordon Lish.” He shares below one of those rejection letters. It’s from Walter Lorraine. 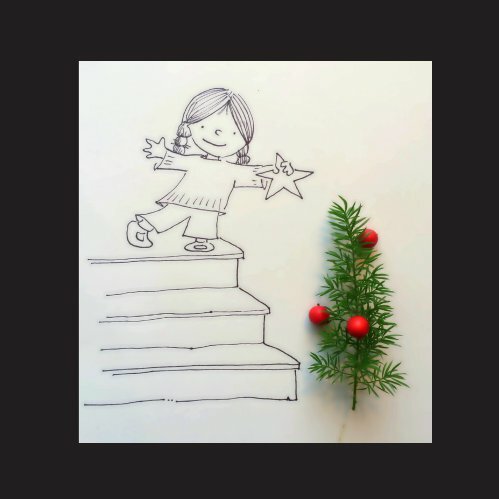 So, You Wanna Write a Picture Book? I write here at 7-Imp (and elsewhere) about picture books. ‘Cause I love them so. I’ve never, however, tried to write one myself (except that time in grad school when I took a course from Jack Gantos, and HOO BOY, was it one of the hardest things I’ve ever been asked to do, but I digress). Despite this fact, I get lots of queries from people who want to publish a picture book but don’t know where to begin. 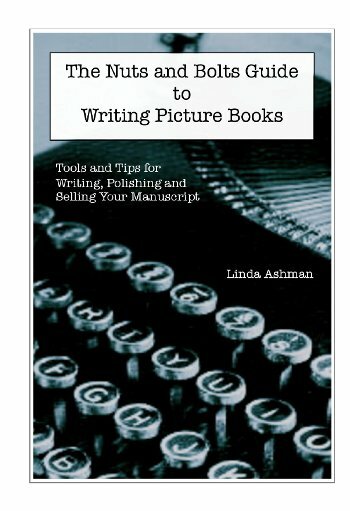 And I’ve found myself telling these people lately about a new handbook from picture book author Linda Ashman (with whom I had a Kirkus chat this past May). It’s called The Nuts and Bolts Guide to Writing Picture Books: Tools and Tips for Writing, Polishing and Selling Your Manuscript. If memory serves me right, she released it this past summer. I’m just now getting around to writing a post about it, though as I said, I’ve personally recommended it to several wannabe authors since then. I love to see a beautifully-crafted Mother Goose collection, and there’s a new one on shelves — David McPhail’s My Mother Goose: A Collection of Favorite Rhymes, Songs, and Concepts, released by Roaring Brook in October. As the sub-title indicates, these are classic nursery rhymes—McPhail sticks to the most beloved ones and doesn’t throw any terribly obscure rhymes into the mix—but he also occasionally pauses to introduce concepts. 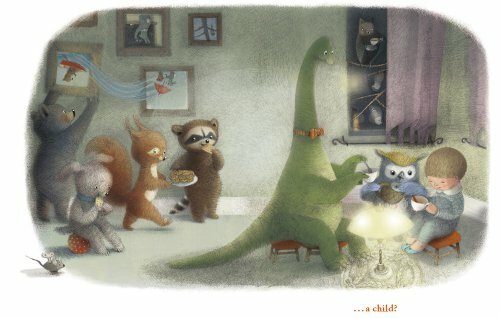 In between, “Great A, little a, Bouncing B” and “London Bridge,” readers pause for an entertaining “My ABCs” spread. Later, readers look at how Henry the Bear gets around (covered wagon, unicycle, train, etc.). There are also numbers, shapes, colors, etc. McPhail opens the book with a note about what nursery rhymes meant to him as a child, and he talks about memories of his own mother reciting them to him — and how he now recites them to his own grandchildren. The book closes with an index of first lines. 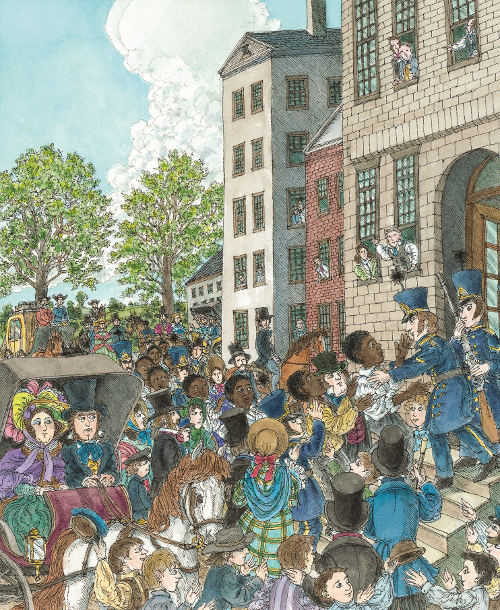 In November at the New York Times (here), Leonard Marcus wisely noted that McPhail’s characters in this collection, as you can see in the illustrations featured here, “are wistful daydreamers who bear a certain family resemblance to those first seen in children’s book art in the path-finding early illustration work of Maurice Sendak.” There are even moments that smack of Richard Scarry. These pen-and-ink watercolor illustrations invite us into a cozy, intimate world. This morning over at Kirkus, I write about Nina Laden’s Once Upon a Memory, illustrated by Renata Liwska. That link is here. Last week, I wrote here about Uri Shulevitz’s Dusk, so I’m sharing some art from it today. 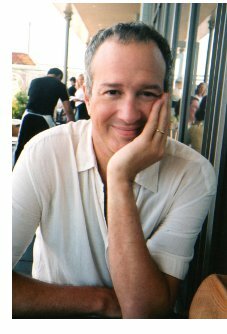 This morning over at Kirkus, I chat with author-illustrator Jon Agee, pictured here. Next week here at 7-Imp, I’ll have some more art from Little Santa, as well as some early dummy images from Jon. Photo of Jon Agee used with permission. Here’s a really quick post (because work calls) to show some artwork from Paula Bossio, who has also worked as a graphic designer and art director and who currently lives in Spain. In fact, this wordless title was originally published in Spain in 2011 as El lápiz. 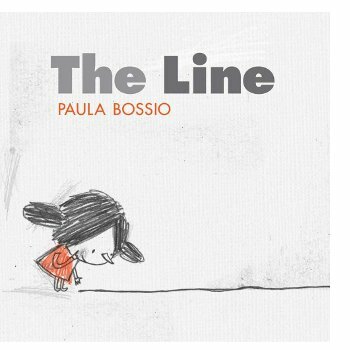 This book is called The Line, and this English edition was released by Kids Can Press in September. It’s the tale of a young girl who finds—you guessed it—a line, and she immediately picks it up to play with it. I don’t want to give a lot of the story away (especially the ending, which is probably a love-it or hate-it kind of closing for many readers), but the line becomes many things to her, as you can see in the illustrations below. Is it her imagination at work or something else? 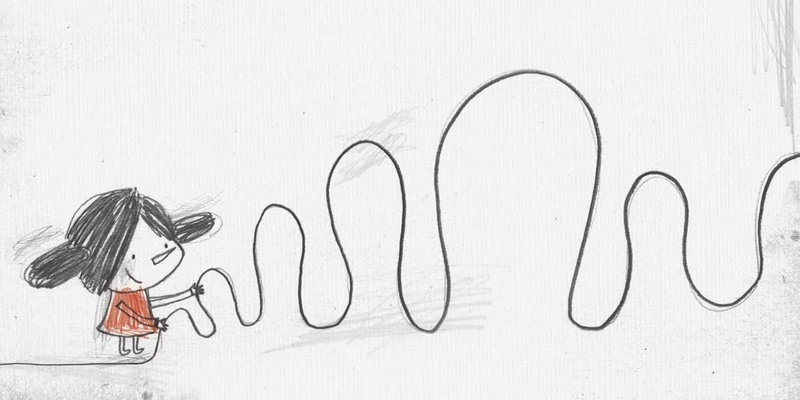 Bossio’s pencil lines are very loose (well, those lines that aren’t the line itself, that is, which is of course super loose), and things get dramatic in this tale. The girl goes from glee to fear to tears in the span of several spreads. It’s a simple tale, stripped down to its basics in these uncluttered spreads, with Bossio showing that a lot can be done with a little. Told you this would be brief. Back to work.